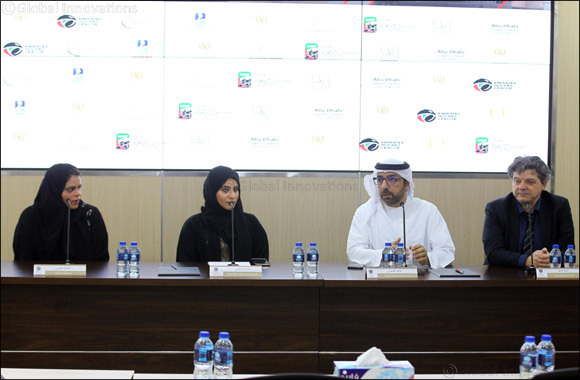 Abu Dhabi, UAE; 14 April 2019: The Fatima Bint Mubarak Ladies Sports Academy (FBMA) along with the UAE Ice Sport Federation announced they are jointly organising the IIHF Women's Challenge Cup of Asia 2019. Kicking off in Abu Dhabi today (Sunday 14 April), the event will gather players from both the UAE and across the world to compete in this six-day tournament from 14-19 April at the Abu Dhabi Ice Rink, Zayed Sports City. During a press conference today held at Abu Dhabi Sports Council, representatives from both FBMA and the Federation spoke about the upcoming championship. Vice Chairman of the UAE Ice Sports Federation Hamel Al Qubaisi, as well as Fatima Al Ali from FBMA, announced that there will be two divisions within the championship, featuring countries: the host nation UAE; Chinese Taipei; New Zealand; Thailand; Malaysia; Singapore; Philippines; India and Kuwait. The IIHF Women's Challenge Cup of Asia 2019 is hosted in the UAE for the first time, outlying the intent of the country to host international sporting events at its world class facilities. Speaking about being part of the organising team, Fatima Al Ali from FBMA, said: “Ahead of this exciting week of ice hockey action here in the capital of the UAE, we would like to thank Her Highness Sheikha Fatima Bint Mubarak, Mother of the Nation, Chairwoman of the General Women's Union (GWU), Supreme Chairwoman of the Family Development Foundation (FDF) and Chairwoman of the Supreme Council for Motherhood and Childhood, for her continued support and guidance in all aspects of sport. Vice Chairman of the UAE Ice Sports Federation Hamel Al Qubaisi, said: “This event is very important because it is specialized for ladies, and the Federation always works to support and encourage women to play ice hockey. Several countries wanted to host this event, but our interest commitment to hosting of the event led to our success in bringing it to the capital of the UAE. Nine countries are participating in the tournament, which is a strong number because it's the first time that the tournament comes to Abu Dhabi. We have completed all the preparations for matches and arbitration. I would like to give my best wishes for all participants.